Animal Farm Napoleon Allegory: Napoleon is named after the French emperor Napoleon Bonaparte, who also emerged as the leader after a revolution. But in Animal Farm he more directly represents Joseph Stalin, the leader and in fact the dictator of the Soviet Union. Like Stalin, Animal Farm Napoleon is constantly changing policies and actions, using secret activities besides of fear tactics and violence. 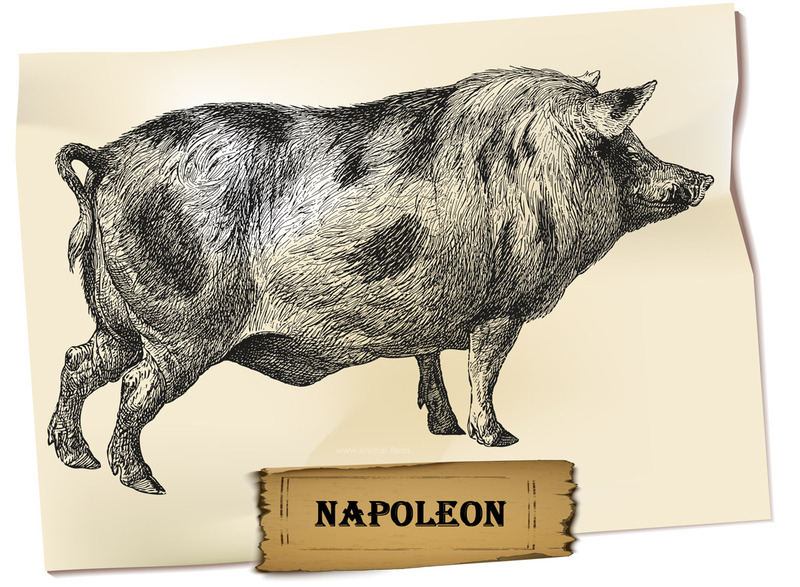 Animal Farm Napoleon Character: He is a sneaky and cowardly Berkshire boar big who becomes the leader of Animal farm after the initial rebellion. He first acts as a common farm pig but then he takes advantage of the animal’s revolt against their masters to turn Animal Farm into a dictatorship. Napoleon is cowardly because he did not put himself out as any kind of major player in the Battle of Cowshed but believes that he is Animal Farm’s destined leader and praises himself for all the things that he has done for the animals. He builds up a secret police (the nine dogs) to sustain his leadership. Later Napoleon takes his rival Snowball’s idea of a windmill and sells it as his own. Finally, he uses his dogs to attack Snowball and forces him out of the farm. Animal Farm Napoleon Legacy: His path is paved with propaganda and terror that none of the animals can resist. But his greatest crime is his complete transformation into Mr. Jones, the former owner of Animal Farm. At the end he sleeps in Mr. Jones bed, he eats from his plate, and he trades with humans. In his final act, Napoleon adapts the Seventh Commandment (All Animals are equal), with a small but effective sentence: But some are more equal than other. The restoration of the original farm name (Manor Farm) shows how he absolutely ignored the words of old Major.